I arrived in Barcelona on Wednesday to help Oli with his Homage to Cataluña shoot on Saturday. The weather was amazing – 20º C and almost December! I took off a layer of winter clothing and the Catalans were putting on their coats! It’s all a matter of acclimatisation. 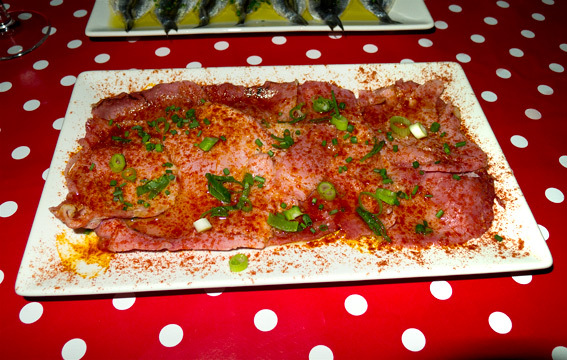 The Carpaccio de Lacón, con pimenton y cebolla tierna, is thinly sliced, braised ham carpaccio, sprinkled with hot pimentón and spring onions. It’s like eating warm, spicy pieces of bacon – very Moorish. Boquerones en Vinagre, are a typical Spanish dish of fresh anchovies, cured in salt water and then vinegar for several hours. The vinegar turns the flesh of the anchovy white. 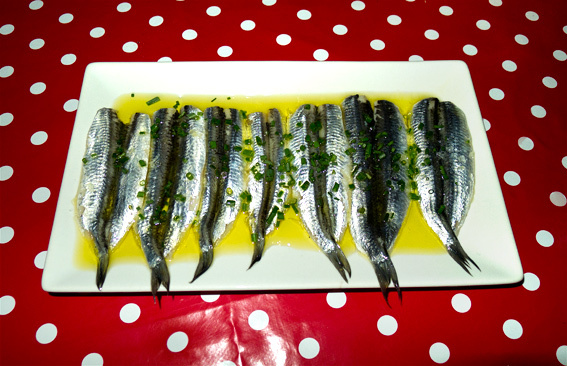 The anchovies are served in olive oil with chopped garlic, and parsley. Cazuelita de Mejillones un poco picante, is mussels cooked in a large saucepan (casserole) with a slightly hot sauce and a sprinkling of parsley. 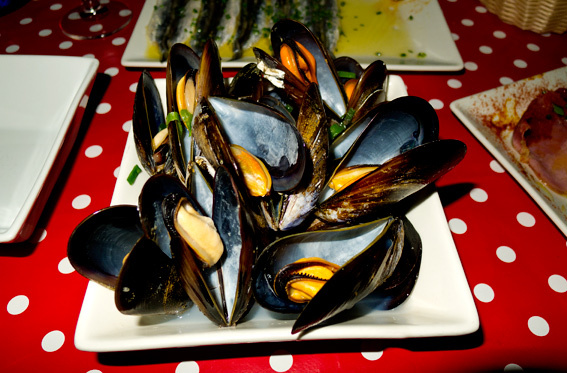 You can see how good the mussels are (and all the food) from the pictures. I was impressed, later on, to see that the chef cleans and prepares each serving himself! There was no indiction of what the the picante came from, but I would assume it was chilli or pimentón, which are common methods of spicing things up. 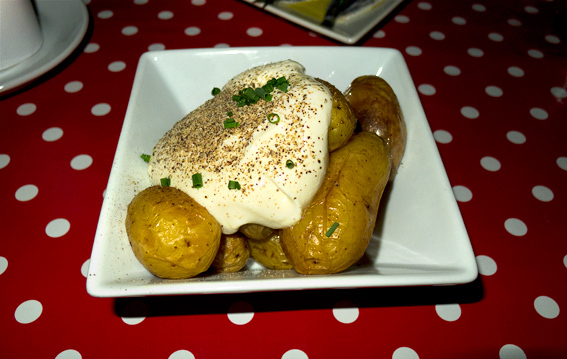 Patatitas al Hormo con allioli de pimienta – delicious baby potatoes, cooked in the oven and served with a very generous helping of allioli de pimienta. I could almost live on allioli – a delicious Catalan sauce made with garlic and olive oil, here sprinkled with pimenton, to give it an extra little kick. 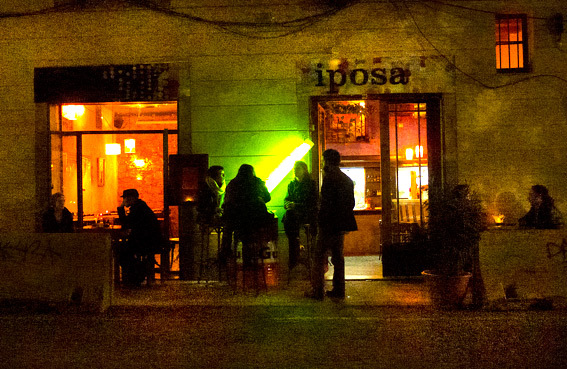 The food was great, the tapas were huge and I was beginning to feel at home again. We drank a couple of bottles of Rosado, rosé from the Penedès, the wine producing region in Cataluña. I drank a lot of Rosado all week, it’s generally very good and rarely gives me a hangover, unlike rosé from other countries. 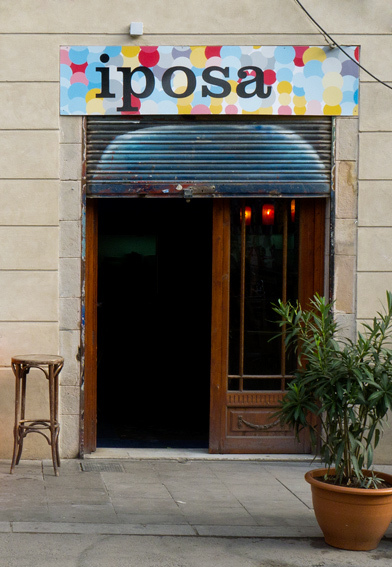 This entry was posted in Barcelona, Barcelona Bars and Restaurants, Drink, Eating Out, Fish, Food, Meat, Restaurants, Spanish and tagged anchovies, boquerones, Carpaccio de Lacón, Cazuelita de Mejillones, Iposa, La Boqueria, Patatitas al Hormo, pimenton, rosado, tapas. Bookmark the permalink. Hola Chica! Thanks for the welcome back, it’s nice to be posting again. I was a bit busy last week, not too busy to take pictures, but too busy to post. I was very sorry to leave Barcelona last night. These all look so good – it sounds like a great evening. I love alioli too and I make it quite often – adding some pimiento sounds a good idea. I could eat allioli on a daily basis – it’s amazing how well it seems to go with almost everything! Fantastic food, nightmare situation for pictures. The descriptions did it for me. They are all flavours that I love. Nice post.